Thank you so much for your mind re-programming help. I been finally able to avoid milk products, which I am allergic to, so my skin is better each week. What you did with my eating habits is awesome too. In the past I had not noticed how many times I ignored being hungry or when I was actually full and continued eating anyway. You really helped on the internal communication with this, cool. Food taste 10 times better and texture of food is more intense. I still have not figured out how you managed to do that. I’m impressed. Chewing the food is more exiting now, I don’t really wanna swallow before I am sure each piece has been fully tasted and experienced, and this comes very unconsciously. Less than 2 months from our session and I have gone down 7.6kilos. During this period I had very stressful things happening in my life. My sick mum had weeks of “life and death” struggling. In the past with similar weeks I had noticed weeks later that my own health was going down with the stress and my healthy life style went out of window. Even keeping the weight in the same level was impossible. Despite the daily emergencies, this time I have been able to care of my mum and myself, loose weight, read 3 books on health, renovate our shop (walls, floors etc., big changes) and run a business. Yeah… things are better this way. I been thinking of few other things to “fix” in me… so, see you in a month. Thanks for making my life a bit easier. Rina Arling – Bergan, Norway. These testimonials reflect the experience and opinions of the writers. They should not be considered as typical or average. 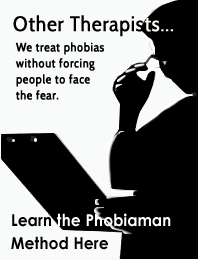 Every phobia is different and results will vary. 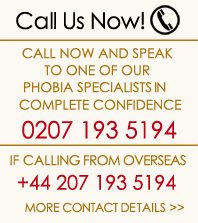 If you would like to find out if our phobia treatments could help you, you’ll need a telephone consultation with one of our specialists. They will be happy to discuss your unique circumstances with you. 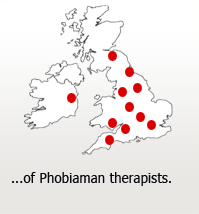 This is because we think it's right to only work with people we genuinely believe we can help. Please call the Clinic on 0207 193 5194, or use the form on the right of this page (or below if you are on a tablet or smartphone), to send a confidential email directly to the Clinic and one of our specialists will be happy to speak with you.